Heat oven to 350°F. Grease and lightly flour 12-cup fluted tube cake pan. In medium microwavable bowl, microwave filling ingredients uncovered on High 25 to 35 seconds, stirring every 15 seconds, until melted and smooth; set aside. In large bowl, beat cake mix, water, butter, 1/2 teaspoon almond extract, the eggs and pudding mix with electric mixer on low speed 30 seconds, then on medium speed 2 minutes, scraping bowl occasionally. With rubber spatula, fold in cherries. Spoon half of the batter into pan; spread evenly. Bake 15 minutes. Remove from oven; immediately drop spoonfuls of filling over batter, keeping filling away from sides of pan and pressing down lightly. Carefully spoon remaining batter over top; spread evenly. Bake 42 to 47 minutes longer or until toothpick inserted near center comes out almost clean and cake springs back when touched lightly in center. Cool in pan 15 minutes. Loosen cake with knife around center and edges of pan. Turn cake upside down onto cooling rack or heatproof serving plate. Cool completely, about 1 1/2 hours. In 1-quart saucepan, heat all glaze ingredients except 1 teaspoon milk over medium-low heat, stirring occasionally, until chocolate is melted and mixture is smooth. Stir in up to 1 teaspoon milk if necessary for glazing consistency. Pour glaze over cake, allowing some to drizzle down sides. 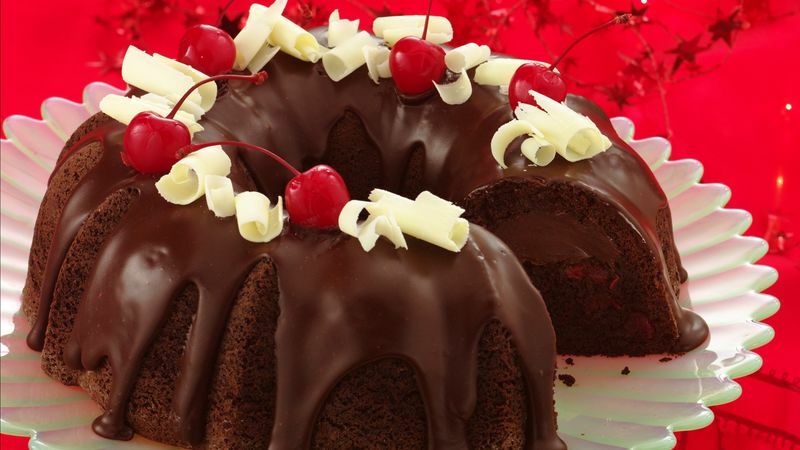 If desired, garnish cake with white chocolate curls and whole cherries. Store loosely covered in refrigerator. To freeze the cake 1 to 2 weeks ahead, make, cool and glaze the cake. Freeze it for about an hour, then cover the cake tightly and freeze for up to 2 weeks. To thaw, unwrap the cake and allow it to stand at room temperature for 2 hours. Garnish if desired. To make white chocolate curls, pull a vegetable peeler against the long side of the bottom of a block of vanilla-flavored candy coating (almond bark). If the curls break, place the block in a warm place for about 20 minutes to soften it for better curls. Be sure to buy sweetened condensed milk, not evaporated milk. They don't work the same way in recipes.